At eProcesses we see most Cost Justifications and or Return on Investment documents for technology investments following the normal Rate of Return, Payback Period, Net Present Value, etc. model. Though sound from a financial point of view, there are underlying elements that are overlooked when it comes to new technology. The chart represents a process where Corporate Strategies/Goals are the starting point for financial analysis. The process then moves to the departments/business units that are going to be involved in the new technology. The departments define their ‘Functional Objectives’ with the new technology and, therefore, capture the motivation for the investment and the business objectives that are to be achieved. These objectives and motives have value and provide direction for the ensuing project. 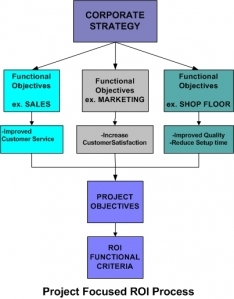 It is up to the project team to quantify the value and include it in the ROI calculation. All of this is then moved to initial starting point of the technology project. To truly achieve the full benefit of your technology investment, eProcesses suggests there is another element to consider. eProcesses observes that companies usually invest in technology to achieve greater value from their Human Resources. But we rarely encounter companies who make the other investment that is required to realize the benefits, the real integration of the new technology into the processes and behaviors of the organization. The ROI that convinced you to invest in hardware or software throughout the company had an underlying assumption that you would change the way you do business. At eProcesses we help you change the way you do business. We help you realize the ROI you initially expected when you invested in the technology. 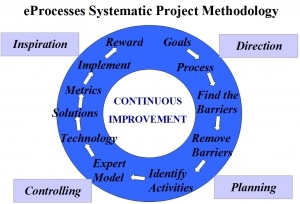 The eProcesses methodology works because we separate ourselves from the normal 5 to 6 step project approach with our unique 10 Phase project methodology. We incorporate strategic and human factors into our analysis that is normally left out in the typical study. We look for the barriers that can cause failures; we then work with you to eliminate those barriers so you can achieve the expected results in your technology projects. If you have already implemented a project and are not happy with the results, we can help you understand why and assist you in obtaining the desired results. Integration is a term that is commonly used, frequently without agreement as to definition. A dictionary definition of “integration” would say “the act of forming, coordinating, or blending into a functioning or unified whole.” It is commonly used, especially in association with technology, purely from the perspective of systems integration. In practice, however, even systems integration involves much more than integrating systems. At eProcesses, when we speak of integration we speak of technical or systems integration but extend systems to include not only technology but business processes and people and their behavior. We believe that a company cannot realize the full value of its investment in technology, in business processes, or in people unless all three are integrated into a effective, efficient, well-tuned whole. New technology is a common path that companies take to improve organizational performance. Rarely will a company make an investment in technology without the expectation of an appropriate return on investment. Companies understand that new tools or technologies may be required to improve the capabilities of their workforces and to improve the capacity of the organization. Technology is seen as a way to improve the efficiency of the workforce or the throughput of a plant or the service level that can be provided. But, technology by itself cannot yield the desired result. For technology to have the desired impact, the technology must change the way work gets done. The way work gets done does not change unless there is also a change in organizational behavior. When eProcesses looks at organizational behavior, it looks at Expectations, Capabilities, and Rewards (ECR). At the macro level, ECR addresses the Expectations, Capabilities, and Rewards of the whole organization. What is expected of us and how do we know? What tools do we have at our disposal to fulfill the expectations and are they appropriate? What is in it for me if I do what is expected (WIIFM)? ECR clearly has application at a micro level also. As applied to the introduction of new technology, the primary focus is on modifying one or more processes, Capabilities in the macro sense, in order to improve organizational performance. At the micro level of ECR, the Capabilities are the tools and information and other resources that are made available to the organization. With respect to Expectations, everyone must have the expectation that the new technology will be used. This setting of expectations starts with executive and senior management and continues to supervision and all who are associated with the new technology. Even peers must have a sense of responsibility for driving acceptance and use of the new technology. On the opposite end of the Expectations spectrum, all steps must be taken to eliminate any sense that it is organizationally acceptable to not use the new technology. With respect to Rewards, some element of Reward and Recognition must be introduced to reinforce the use of the new technology. This R&R can be written or oral accolades or admonition. The R&R can be monetary. The identity of the R&R appropriate to a specific technology introduction will depend on the specific organization. The primary reason that companies purchase new technology is to change the way work is done. Processes, or the results of those processes, may be seen as either ineffective or inefficient. In either case, change is warranted. Companies that adopt new technology without understanding their processes and the weaknesses of those processes are destined to pursue suboptimal, or simply unsuccessful, technology implementations. The high percentage of implementations judged less than fully successful within the popular press would lead one to believe that too few companies pay attention to this step. There is a large volume of literature detailing the techniques for process documentation and process reengineering. Lack of educational materials is clearly not a problem. However, there appears to be a lack of understanding of the importance of this step. Sometimes it might be a budget consideration, but it is more likely a lack of awareness that is the issue. But, it is one thing to change the design of processes and another thing to get people to actually do the processes differently. The key to changing organizational results is, ultimately, changed organizational behavior. A company can acquire new technology, but, by itself, that will not alter organizational results. A company can redesign organizational processes but, unless people actually do their work and manage their work differently, even process change and processes integrated with the new technology, there will not be performance improvement. At the risk of simplicity, the key to performance improvement is getting people to perform differently. To get people to perform differently, a company must understand why the changes are needed, how technology can improve performance, what performance improvement is possible without technology, and they must understand the management implications of these changes. And, they must understand what is expected of them, especially during a time of change. Managing expectations means that people understand what is expected of them, and why. These expectations are communicated through the behavior of management. These expectations are communicated by what behaviors and results are rewarded, and how. These expectations are communicated through the way people are trained, and managed, and reviewed. People at all levels need to have a clear understanding of what is expected of them, of what the new processes will look like, of how they will be managed, of the criteria that will be used to assess their performance, of how they are progressing, and of how they will be rewarded for improved performance. They need to know how they will be integrated into the whole of the organization. Effective change that involves technology requires total integration management. Technology must be integrated with business processes and with the behavior of people. Expectations must be aligned with capabilities and rewards. To integrate technology with processes and people, you must first understand the current processes and behaviors. Then, you must understand how the technology will alter those processes and behaviors. Then, you must change the design of the processes and behaviors. Finally, you must implement the new designs and manage to those new designs. Technology cannot be implemented in a vacuum. Processes cannot be altered without consideration for the technology and the behavior of people. Behavior cannot be changed without consideration of the goals and objectives of the organization, the technology of the organization, the processes of the organization, and the culture of the organization. Total Integration Management suggests a consideration of all aspects of the organization when seeking to implement change. Such a thorough consideration of the breadth of organization will, ultimately, help to assure the realization of the return on investment that is proposed by the technology or process change initiative.